Communities Minister Andrew Stunell has taken part in a ceremony to mark the abolition of the transatlantic slave trade. 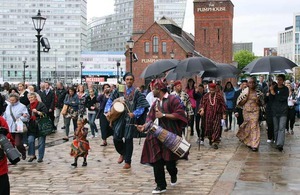 The event, took place at the Liverpool International Slavery Museum, to promote understanding of the slave trade and the consequences being felt today. Mr Stunell’s speech emphasised the importance of addressing the challenges of modern day slavery, discrimination and disadvantage and the government’s commitment to tackling race inequality. “Acceptance and understanding of our past is important in moving towards a future which is free of intolerance and racism. Carnivals and performances are being held today in Bristol and London and will be followed by a programme of educational events throughout the year. The Department for Communities and Local Government wants to break down the barriers that small voluntary and community organisations can face. The minister will announce that workshops are to be held in the autumn which will help Black and Minority Ethnic-led organisations access funding for educational and heritage events (including those on the remembrance of slavery and the slave trade).